For Internet users, accessing a web page from your mobile device or from your desktop computer, involves entering on some opportunities the address or url of the page you want to visit, or clicking on a link provided by a search engine such as Google. The above implies that we usually enter something of the type www.icomercial.cl, if we put the “www”, but the browser automatically assumes that we are visiting a URL that begins with the letters “http”. However, this is changing strongly in the world of browsers, mainly because both Google, through Chrome, and the Mozilla Foundation, through Firefox, are adding a subtle message in web browsers that indicates whether a site is Sure or not, at least through your url. Therefore, if you visit a site that only has http, without the “s” after the “p”, the browser will try to warn you that you are visiting an unsafe site. This is not coincidence, and corresponds to an effort to get websites to communicate with their users through the protocol “https” and not the “http”. The difference between the two is that the first one does it through a secure connection of the SSL type, and the second connects without this type of security. Configuring these certificates has some degree of technical complexity, which ranges from contracting a certificate for one or more web domains, associated with a respective web server, to the installation and renewal thereof, both in the certifying entity, as well as in the hosting provider. 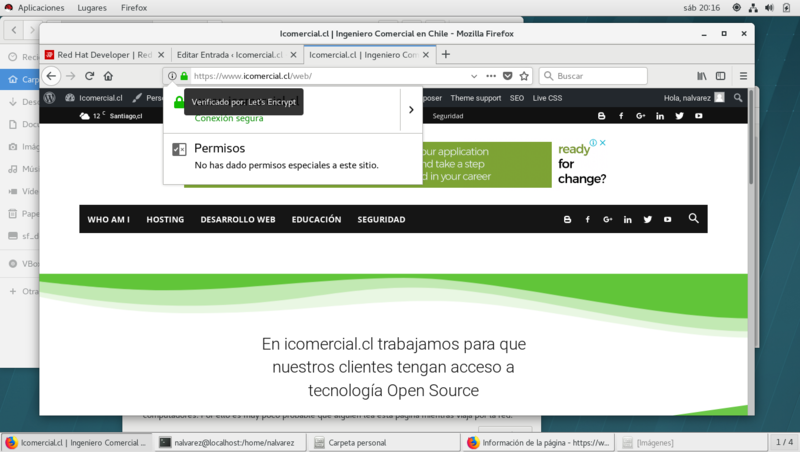 In Icomercial.cl we are using a certificate provided by Let’s Encrypt an entity that delivers free certificates with a duration of 3 months, which allow to avoid that web browsers identify the site as unsafe, and also allow to establish communication between the web server and the team of visitors safely. The configuration of this type of certificates, implies an additional technical effort that has not been easy to acquire and develop, however, thanks to the disposition of our suppliers, it has been possible to configure and prove without problems this new technology. In addition to the security warning that appears in browsers that do not have SSL or have it configured incorrectly, the main Internet search engines are privileging the search results of those sources that use the “https” in their web pages. Although the algorithms used to rank or order search results are not completely known to avoid perverse incentives, it is totally logical that if you have reached the point of obstructing the user when visiting sites that are not safe, it is most likely that two search results, one without https and one with, the first one that has more security measures.